In 1813, Lieutenant Colonel Heathcote, Commanding Officer of the Royal Newfoundland Regiment, was ordered to move his headquarters in Kingston to the Provincial Capital of Upper Canada at York. The Regiment now had the Flanking Company at Fort Erie under Captain Whalen and another company under Captain Mockler at Fort Amherstburg with the remainder of the Regiment at York. The York defences were weak, consisting of the Western Battery outside the Fort, a blockhouse, temporary magazine, and a ditch enclosing Government House and barracks. Troops consisted of two understrength companies of the Newfoundland Regiment, a company of Glengarry Light Infantry, two companies of the 8th King's Regiment, and a handful of Indians. The Americans were intent upon a spring offensive to reverse some of the defeats they suffered throughout 1812. They settled on York which had weaker defences than Kingston and was the seat of government. 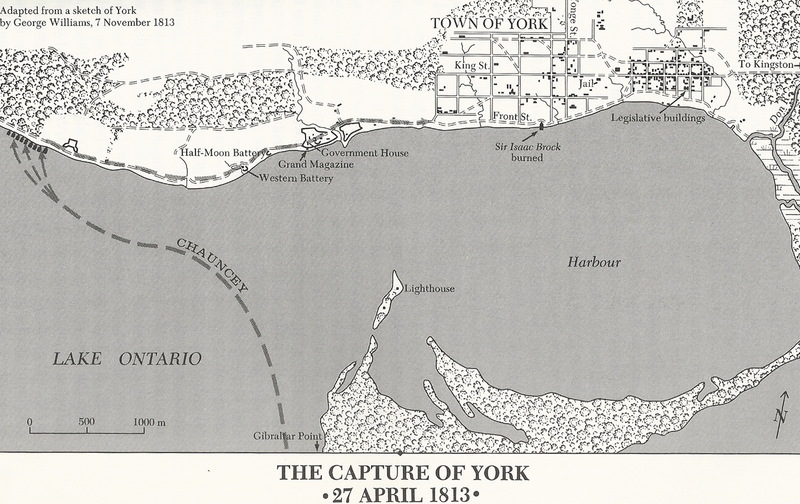 On April 26th Major General Henry Dearborn led a force of 1700 troops supported by ships under Admiral Chauncey across Lake Ontario intent on the capture of York. The British at York were commanded by Major General Sheaffe, not a popular figure in York. There was no British naval presence. The town was defended by about 700 British troops which included 92 members of the Royal Newfoundland Regiment under command of Lieutenant Colonel Heathcote. The Americans landed at Humber Bay several miles west from York. The Royal Newfoundland Regiment were sent out to delay their march toward York. Thirty six of The Newfoundland Regiment were killed or captured by the Americans while attempting to delay the advance. This amounted to about a third of the Newfoundland troops. Everything subsequently went wrong for the British and Sheaffe was not personally present to rally the troops after the Western Battery magazine accidentally blew up its defenders. The British were entirely outnumbered and decided to blow up the powder magazine in Fort York to ensure that the Americans could not use it. This massive explosion, marked by a large mushroom cloud, killed Americans and some British prisoners alike. The British evacuated the Fort and retreated to Kingston without attempting a counter-attack. The town was then occupied by the Americans, burned, and much civilian property looted or vandalized. This incident created passionate feelings of injustice and seeking of vengeance by Upper Canadians. This defeat was a disappointing and humiliating reversal. A series of accidents, lack of naval support, and a monumental lack of decisive leadership by Sheaffe all contributed to a major debacle. For the Americans, the aftermath of the action with the needless pilfering and destruction of civilian property was an embarrassment and the British ultimately paid in kind with the burning of Washington.